One of the things I have loved most about the past 8 months is watching my shape change… Yes I describe my back as sponge bob as its totally square but that’s not a lot to complain about! I was small carrying Bella but am definitely a lot bigger this time… All over! I said on Sunday in front of my dad that I seem to be carrying a lot in my back, he piped up ‘funny you say that I can actually see two lumps at the bottom of your back’ Thanks dad! I’ll not correct him on the love handles as I have really enjoyed them cream eggs! Dressing the bump hasn’t been overly hard as at first if it wasn’t work wear it was comfies and more recently my washing pile has been made up of loungewear and pjs. The sofa doesn’t judge me, I wish I could say the same about Colin however he’s very polite and says nothing but I can see that look. The benefit of this is whenever I do pull myself together the compliments come thick and fast, perhaps as a tactic to make me consider the daily effort. Now heading into the last couple of months of pregnancy and the bump growing at a fierce rate I can try to mix up my clothes and experiment with style to show off my best accessory (which I know I will miss). With a maximum of 8 weeks left I find it hard to justify buying a whole new wardrobe. 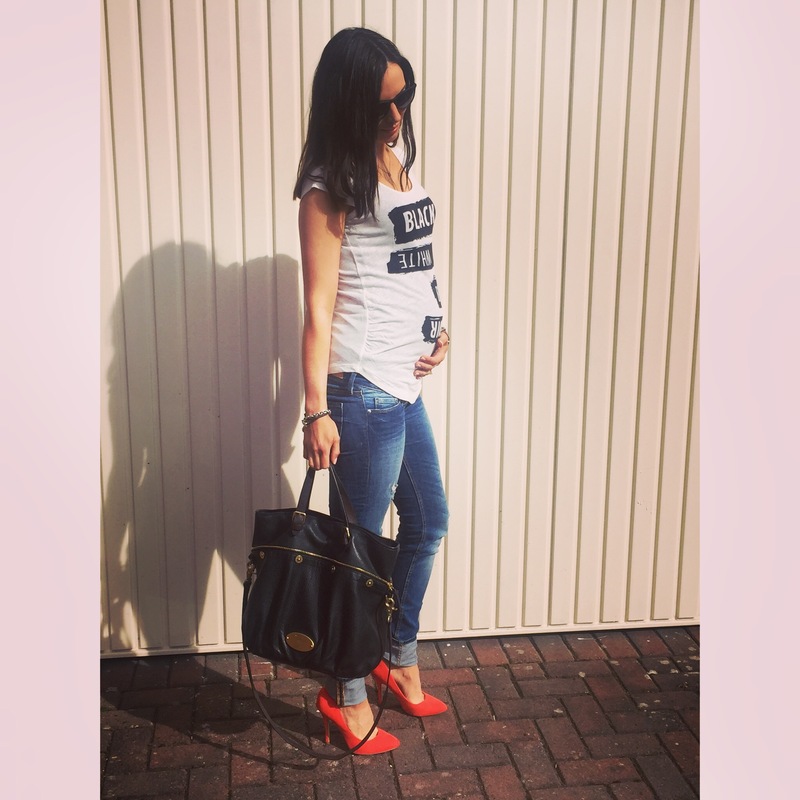 I got away for so long with my normal tops and a pair of maternity jeans or normal harem pants…. That won’t cut it anymore. It’s amazing when you look through your wardrobe how many little dresses, shirts and tops you can layer with vest tops but trying to maintain some of your normal style can be tricky! I am so determined not to live in black leggings, as comfy as they are. I had to order a few pieces to keep me sane and mix up the wardrobe a bit, this included 2 dresses, a pair of lighter wash jeans, 2 tops and a pair of print trousers (feel like pjs on!). These are maternity (except the dresses) as I hate the look of wearing regular jeans 2 sizes bigger and them sagging everywhere. Just because you get away your whole pregnancy without maternity wear does not mean it looks good plus it must be so uncomfortable! I can’t say when I’m going out its to anywhere exciting, today my getting dressed and making an effort excuse is for an appointment to see the consultant (and the reason I’m getting time to write this due to how insanely busy it is). It is definitely nice to put the effort in, even if that currently means more recovery time after the shower than what I would have needed after a 10 mile run. 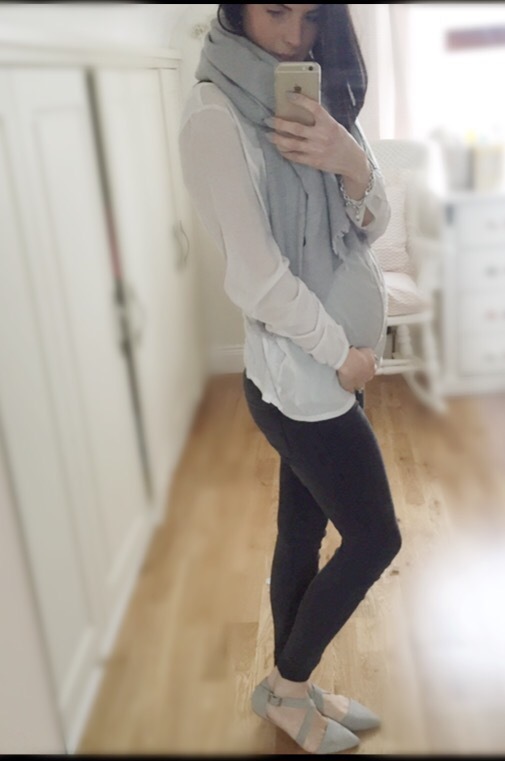 Here’s a few of my bump looks recently and I will try to add some more in the coming weeks. H&M harem trousers £19.99, last season regular top New Look, shoes £3 Primark, Bag Mulberry. 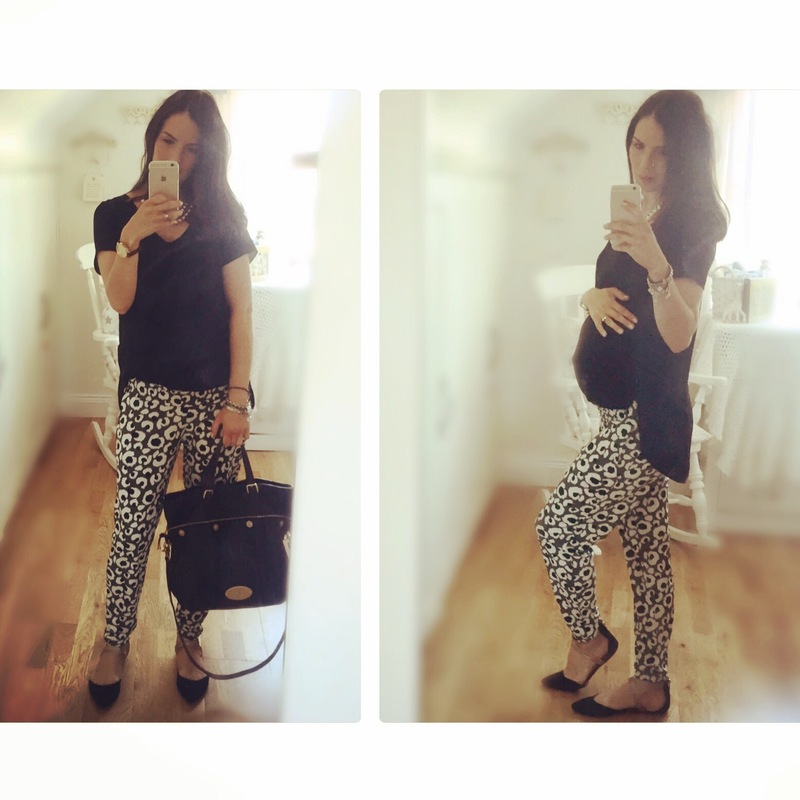 These trousers are under the bump but so so comfortable! I love black and white but I’m ready for warm weather now. 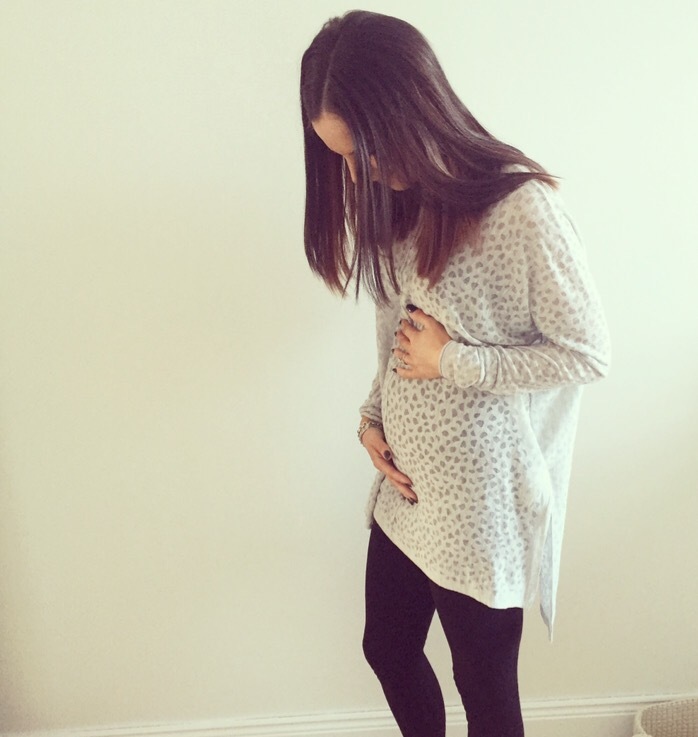 25 week loungewear and this blanket cardigan is my go to cosy staple. 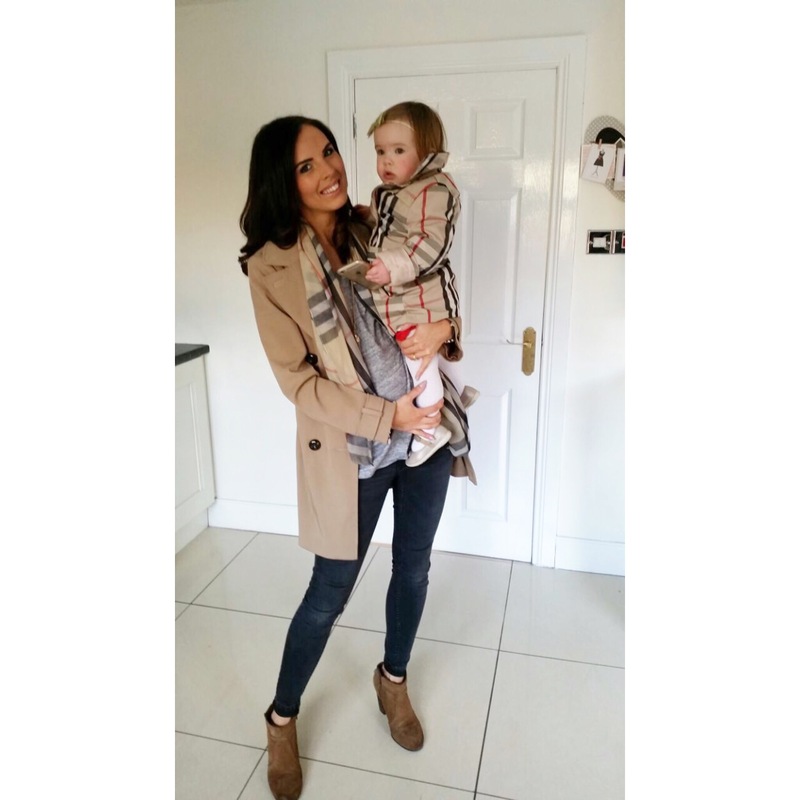 Cardigan from My Highstreet Style!